With Berlin & Beyond, the Goethe-Institut is bringing the best films from German-speaking countries to the screen in San Francisco for the 21st time. Julia Jentsch, who received the Spotlight Award in Acting from the festival, travelled to the hilly city for the first time. In our interview, she talks about her new film that looks at the taboo topic of abortion. As the largest German-language film festival in the United States, every year Berlin & Beyond shows films from Austria, Germany and Switzerland. 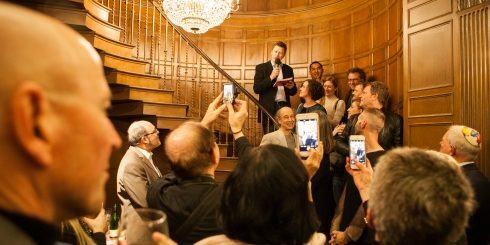 In addition to Julia Jentsch, this year the Goethe-Institut San Francisco welcomed celebrated guests such as Maria Schrader, Stefan Haupt and Moshe Cohen to the Castro Theater. Julia Jentsch is known from her work in films like Sophie Scholl – The Final Days and The Edukators. Both films were very successful both at home and abroad. 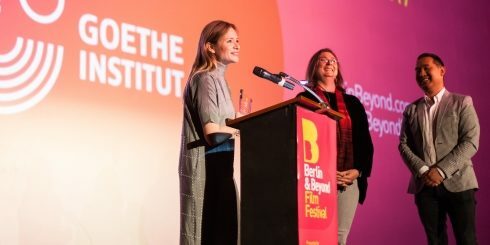 The Berlin & Beyond festival is presenting her latest film. 24 Weeks is a drama about a couple grappling with the disability of their unborn child. Opening party for Berlin & Beyond at the German Consulate General in San Francisco. | Photo: Barak Shrama Ms Jentsch, welcome to San Francisco. You received the Spotlight Award in Acting at Berlin & Beyond for your latest film 24 Weeks. What was your initial reaction to the invitation? I was thrilled to have another opportunity to present the film overseas this year. 24 Weeks has travelled around a great deal over the past weeks and months, but I could sadly never go along because I was working. It finally happened here in San Francisco. To be frank, I only read last night in the programme that I was also receiving an award. But I would have come even without an award. What are your plans in San Francisco? I definitely want to see some of the other movies on the festival programme that I missed at home and visit the new San Francisco Museum of Modern Art. I also want to get some impressions of the steep streets, the famous streetcars and, of course, the waterfront – images we already have in our minds of San Francisco. Have you ever travelled for the Goethe-Institut before? Yes, for Sophie Scholl. They were always impressive experiences. The dialogue is especially exciting: How do people elsewhere respond? 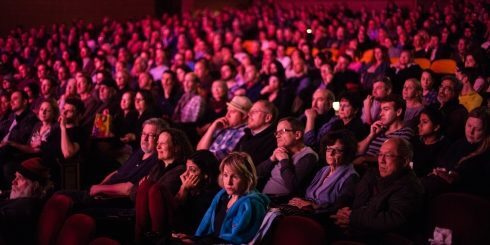 The audience at Berlin & Beyond are immersed in the programme in glowing festival pink. | Photo: Barak Shrama 24 Weeks deals with the abortion of a disabled child: it’s a controversial and emotional topic. It’s an intense topic, but had an impressive script. The dialogues spoke to me at once. Nobody wants to be faced with the situation the film couple experiences. It affected me deeply and I wondered if I would want to deal with this material for the next few months and what it would do to me. My concerns disappeared after meeting with the director Anne Zohra Berrached, whose work I liked so much right away and who made me feel I was in good hands. Our conversations about ideas for the film made me want to join her in this journey. Filmmaking is always a journey; for the directors even for a longer time than for the actors. How did the work on the film affect you? The encounters associated with it touched me deeply: strangers who told me about what was probably the most intense and difficult time in their lives. There were extraordinary moments of candour. I was amazed to learn how many people are affected by the problem. More than 90 percent of people in similar situations decide to have an abortion. That’s why I understand why Anne made the ending of the film exactly like she did and thereby put the topic up for discussion. Sigrid Savelsberg, director of the Goethe-Institut in San Francisco, and festival director Sophoan Sorn with Julia Jentsch at the award ceremony at the Castro Theater. | Photo: Barak Shrama Abortion is a taboo subject for lots of people. Is film the right medium for encouraging a debate? Film is still one of the strongest media and enables us to reach many people in a very direct and intense way and to initiate decision-making processes. The fact that the film was able to celebrate its premiere at the Berlinale competition was incredible and courageous for the young director and the young producer Johannes Jahnke. The Berlinale is a great forum, but anything can happen there. But the great feedback showed that the film reaches the people. Abortion is a very controversial subject in the United States. President Trump just resolved to cut funding for aid organizations that counsel people about abortion. Do you think the film can have an impact? The interview was conducted by Sigrid Savelsberg, director of the Goethe-Institut San Francisco.